Commonly known as Marienkirche amongst the locals, it is one of the most beautiful sights in Berlin to visit. It is home to the famous fresco- Dance of Death painted in the year 1945. Although it was a modern Roman church pre the protestant period, after the protestant reformations it has turned into a protestant church. There are hints of the initial architecture that adorned the walls and interiors once upon a time, but maximum portion of the church is a result of the modern renovation work done in the present time post 1945. Also, visit the popular attractions in the city by following Berlin itinerary 4 days. Maintain tranquility when you visit the church. How popular is St. Mary's Church? People normally club together Bebelplatz and Galeria Kaufhof Berlin Alexanderplatz while planning their visit to St. Mary's Church. Beautiful church! Was lucky enough to make it for a baroque organ show when I was there. (The sign said they have this on Thursday and Friday's at around 5). The musician invited us upstairs to get a close look at the pipe organ and he explained how it works. He also played some beautiful pieces on it!!! What a lovely experience! The show was free, but leaving a donation allows them to maintain the pipe organ. Conveniently placed close to Alexander Platz, it is a great option to go in and collect your thoughts or light a candle for someone you love. Intrigued by the drawing at the entrance, which seems to depict a fun extraterrestrial party. Very X-Files. 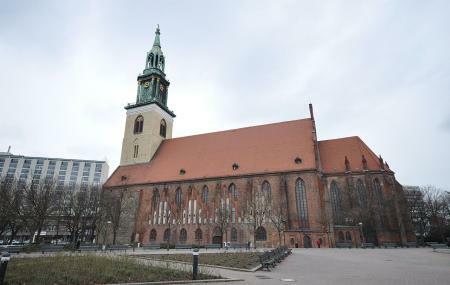 Oldest church in Berlin, located near Alexanderplatz. Very beautiful inside. You can find here several interesting paintings. Absolutely recommend to visit this calm place. Beautuful medival church in the heart of Berlin city Center, right next to alexanderplatz and fernseheturm. One of the oldest churches in Berlin. Inside the church you can find breathtaking baroque organs where famous musicians used to take their first organ classes, as well as famous fresco painting - the dance of death.